You want both fruits and gems? 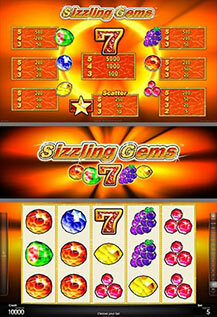 – "Sizzling Gems™" is the answer! This 5-line (fixed), 5-reel video game combines an entertaining fruit game with the luxurious world of sparkling jewelry. Have fun with this enthralling game! All wins are for combinations of a kind and are paid for combinations left to right on lines (fixed), except scatter. Scatter symbols pay at any position. Scatter wins are added to line wins.